Tinkle Eyebrow Razor Review | Is It The Best Eyebrow Shaver? It’s not you. It’s your eyebrows. If you’re looking in the mirror and wondering what you need to do to get those eyebrows on fleek, well, I am here to help. Actually the Tinkle eyebrow razor is here to help. This little eyebrow shaver is going to make your life a lot easier when it comes to getting that perfect eyebrow arch. Not only that, but they are great for dermaplaning to exfoliate and erase any peach fuzz you might have on your face, or other body parts. The name might incite some giggles, but it is a serious little eyebrow archer that can do a number of jobs. In this review of the Tinkle eyebrow razor, I’ll highlight a bunch of the things you’re probably going to love about it as well as a few cons. That way you can decide if it is going to work best for you. If you are a guy looking for tips on how to trim men’s eyebrows then take a look at this handy guide, too. These handy little eyebrow shapers razors are made by Dorco, the same company that makes the razors for the Dollar Shave Club that is so popular in the men’s shaving market. As a company they don’t get the recognition of a Gillette or Schick, but they are every bit as good as those bigger name brands. And for a fraction of the cost. So, what are Tinkle eyebrow razors, exactly? They are a single blade razor with a plastic handle. It doesn’t look like a typical disposable razor at all. The blade itself is secured with a sort of comb attached to it. This way there is only a tiny fraction of the blade exposed making it safe to use on your face without slicing yourself. That’s not to say that you don’t have to be careful, though. It is still a razor after all, so make sure you keep it out of the reach of children. They way they are meant to be used is primarily as an eyebrow shaver to edge your eyebrows. Not to trim them down. But to get the fuzzy hairs around your brows that the tweezers can’t get. And you can shape your eyebrows with them to get the perfect arch. To do this, look at your eyebrows in the mirror and make a plan of how you want them to look. This is easiest to do when you have already had your eyebrows threaded or waxed so you are just following the original edges. If you don’t know how to use eyebrow razors and your eyebrows are overgrown, this may take a bit more planning. To make your life easier, here is a quick video on how to shape your eyebrows with an eyebrow razor. The key is to hold the blade as parallel to the skin as possible. This will prevent irritation and also any nicks. Use a moisturizing cream or oil where you want to shave your eyebrows to give the blade a little lubrication so it glides across the skin and doesn’t catch. Be slow and methodical. You don’t want to move too quickly so you can stop and evaluate your progress. Any mistake at this point can be fixed, but if you get too deep into the procedure then you might have a tough time fixing your brows. 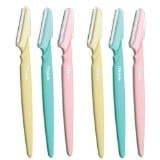 In addition to eyebrow shaping, the Tinkle eyebrow razors are great for dermaplaning. It’s just shaving your face. Yup, even women need to shave their face. But, literally the whole face. Where guys only have to shave where their beard grows, dermaplaning involves shaving from your forehead all the way down past your chin. It all depends on where that fuzzy hair is growing. Usually it is mostly on the cheeks, but it can literally grow anywhere. What is the benefit to dermaplaning? For starters it is great at exfoliating the skin. It strips away the dead layer of skin leaving the new, softer skin underneath giving your skin a beautiful glow. The other benefit is to rid your face of the peach fuzz that makes it difficult to apply makeup. When you’re applying foundation, it won’t clump up because of the hairs on your face. 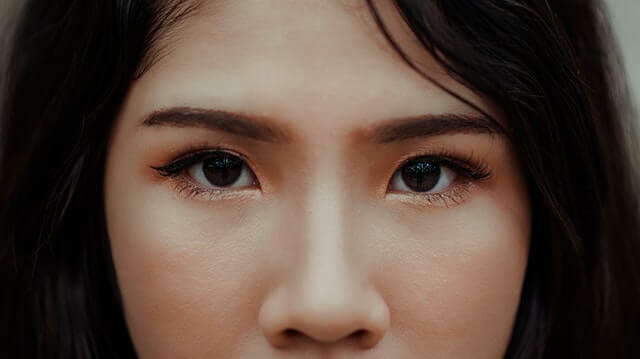 Even if you don’t realize you have a hairy face, the hairs can be so fine that they are barely noticeable, your makeup will go on much more evenly after dermaplaning. It’s best to just use it literally all over your face when you are just starting out to see how it goes. After a while you will get an idea of if you need to do the entire face or not. Honestly, there isn’t a lot to not like. They are simple razors without any bells and whistles. They basically just do the job they are supposed to do. But, if I have to nitpick, then I would say the negative to these razors is that they get dull quickly. They aren’t extremely sharp, to begin with since they are not to be used as a razor for your legs. But, if the edge lasted longer, they would be perfect. If you want to see how they compare to other eyebrow trimmers then you can check out our reviews of the best eyebrow, nose and ear trimmers here. Q: Will my hair grow back thicker and darker after dermaplaning or shaving my eyebrows? A: This is a very common myth that persists even though it is really not true. No, your hair won’t grow back thicker, darker or worse than before you shaved it. One of the reasons your hair on your face is very soft is because it has been exposed to soap, sun, water, makeup etc. The exposure to sun makes the hair lighter, and as it grows it gets finer anyway. Imagine the base of the hair being thicker than the end and you get the idea. If you shave that off, the new hairs seem thicker because the base is what is growing first. That new growth hasn’t had time to soften up with exposure to the elements. Yes, when you run your hand over your face, the new growth feels coarse. Because it is. But as it grows in it will eventually become as soft and fine as it was before you shaved it. The key is that it takes time. So, you may need to shave often once you get started dermaplaning. Q: Can I use the Tinkle for dermaplaning with acne? A: If you are suffering a recent breakout of pimples, then it is best to treat the acne first then do the dermaplaning. It is very easy to burst your pimples which could lead to bleeding, scarring, and actually more pimples since you are spreading the bacteria across your face. Once your acne is under control then you can use the Tinkle eyebrow razor. Q: Will Using the Tinkle razors cause acne? A: No. Quite the opposite, in fact. If you exfoliate by dermaplaning with the Tinkle, then you are cleaning out the dead skin from your pores which will help you prevent acne and leave your skin blemish free. 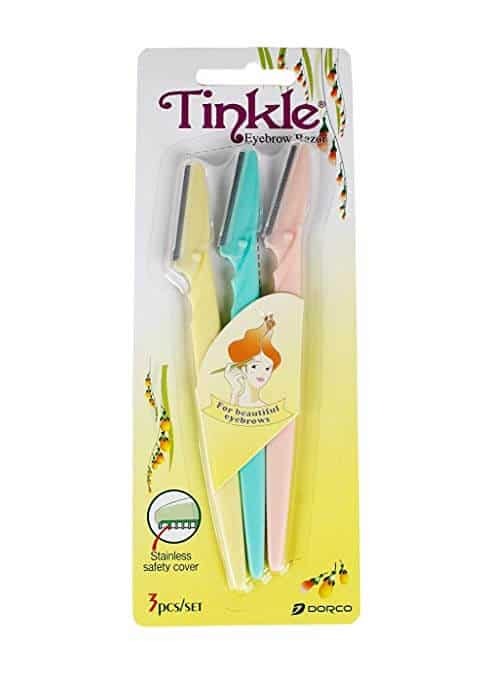 I hope this Tinkle razors review has helped open up your eyes to eyebrow grooming. It may seem strange to shave your eyebrows to arch them or to shave your face for better skin. But, that is exactly what these eyebrow shaper razors can do for you. For just a few dollars, you can get so much done for your face. Your eyebrows will look awesome, your skin will end up glowing and your blemishes banished. Got any questions about the Tinkle razor or about dermaplaning in general? Drop a comment in the box below and we’ll get back to help you out as soon as we can! !